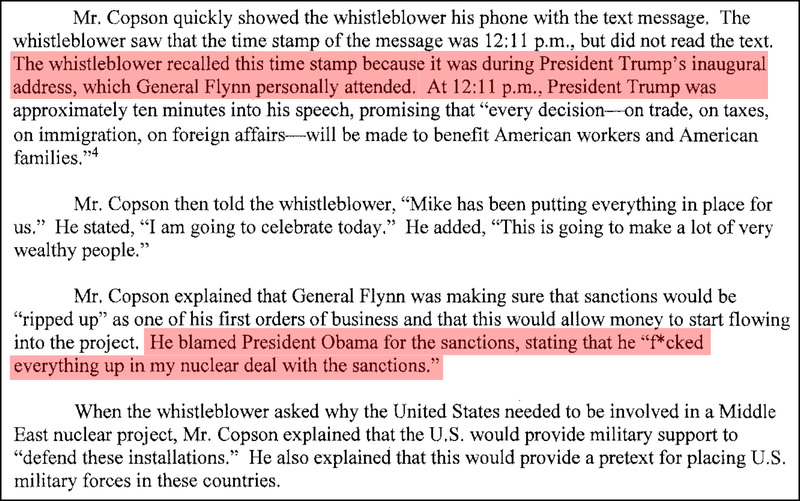 ….According to the account detailed in the letter, the whistle-blower had a conversation on Inauguration Day with Alex Copson of ACU Strategic Partners….During the conversation, Mr. Copson told the whistle-blower that “this is the best day of my life” because it was “the start of something I’ve been working on for years, and we are good to go.” Mr. Copson told the whistle-blower that Mr. Flynn had sent him a text message during Mr. Trump’s inaugural address, directing him to tell others involved in the nuclear project to continue developing their plans. “This is going to make a lot of very wealthy people,” Mr. Copson said. This man was our top national security official for a month or so. Why? Because Donald Trump hires only the very best people.